Explore science with hands-on exhibits. In Vital Space, you will explore inside the body of an infected astronaut and compete in a series of virus fighting games to save your team member. Investigate the the social and economic choices that shape the Amazon's future in the Amazon Voyage. Also, learn about the mysteries of aging and Newton's Notions. • Take I-95 Exit 1A. 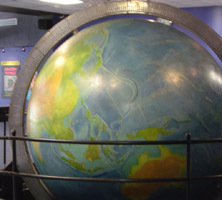 • The Miami Museum of Science is located at 3280 S. Miami Ave.